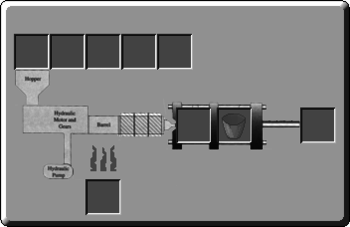 This picture demonstrates an automated Injection Molder which uses Pumps, a Pipe, levers, chests and simple Flow Networks to automate input (top left), output (front) and fuel (bottom right). 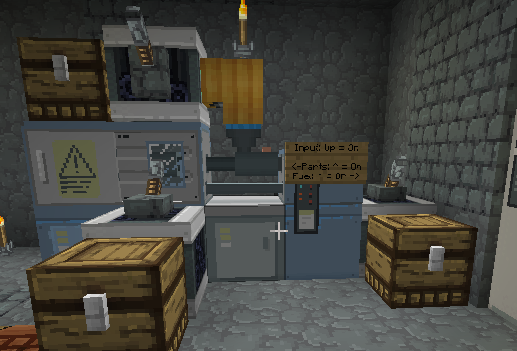 The injection molder is one of the Polycraft Inventories that can be built at Tech Level 2. An injection molder allows thermoplastic processing of polymer melts. Note that not all polymers can be melt processed. As a rule of thumb, resins, which are thermosets much be processed by conventional means and not through an extruder or and injection molder. To get an injection molder to work, you must supply the proper Mold made from a qualified metal, cooling water and Fuel. The type of polymer pellets used will determine the strength and robustness of the printed part. In the early game, the Injection Molder is essential for making Gaskets out of PolyIsoPrene, which in turn allow for pressure regulators, which are necessary for Distillation Columns and much, much more. This page was last modified on 29 August 2018, at 18:41. This page has been accessed 15,668 times.